Welcome to our website with in-depth detail on all aspects of our training operation here at Ditcheat. So much has happened since Paul arrived here 27 years ago in October 1991 with eight horses. As the winners began to flow we worked hard to upgrade things year on year, adding better gallops, improving facilities and building more boxes until we now have around 128 horses in training in our two yards. We’ve been lucky enough to train some great horses including See More Business, Kauto Star, Denman, Master Minded, Neptune Collonges, Tidal Bay, Silviniaco Conti and Big Buck’s. They and many more contributed to Paul winning 10 trainers’ championships in the last 12 years. Ours has always been a team effort with our hugely experienced head lad Clifford Baker leading by example from the front. He is the first man into the yard long before dawn each day and the last to leave in the evening. For all the success that has gone before us here at Ditcheat we are constantly looking forward and focused on ensuring the future success of the yard. Throughout our team of staff there is a deep rooted ambition to continue competing and winning some of the very top races in National Hunt racing and with high class horses like Politologue, Dynamite Dollars, Frodon, Clan Des Obeaux and Topofthegame that trend looks set to continue. For many, the most exciting part of the yard currently is the wealth of young equine talent looking ahead to the coming seasons and it is with great pride we can once again say we are enjoying another fine season, the highlight coming on Boxing Day when adding a famous tenth King George Trophy to our roll of honour. Already through the million pound prize money barrier it has now been 19 consecutive seasons we have achieved that feat, something we are all very proud of. 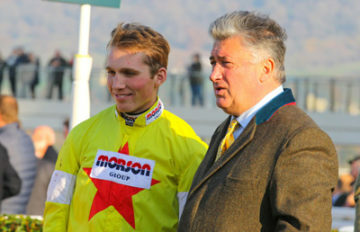 It was on New Year’s Day of 2019 when Paul became the tenth most winning trainer in Great Britain of all time and for some time now it has been on Paul’s radar to get to the 3000th winner mark, an achievement that creeps ever closer and is something that Paul and all the team would be incredibly proud of. We are now looking ahead to the spring with great optimism and focused on assembling a powerful team of horses to head to Cheltenham, Aintree and the rest of the valuable spring meetings. On the website you will be able to get to know all the skilled and dedicated people in our team that work hard to ensure our horses have the best of care at all times, see the world class gallops and training facilities we have and keep up to date with all the latest news from Paul himself and his assistant Harry Derham with his popular blog. We pride ourselves on providing the highest level of care for our horses and hope that comes through as you take a virtual look round our operation.